Bin Storage Cabinets are made from materials with high density warehouse tool storage and for arranging electrical and mechanical parts. These cabinets offer quick access to contents and maintain cleanliness and security. From durable polyethylene with molded-in back for reliable hanging these bins are made of. The front edges are lowered for better visibility and easier part picking. 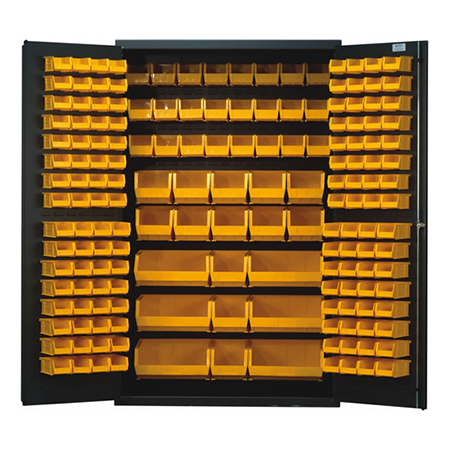 When not in use, the bins can be stacked on shelves, worktables, carts, or other flat surfaces. Bin storage cabinets come in three sizes: 60″ wide, 48″ wide and 36″ wide, each with different configurations of bins and/or shelves.